The mission of Popular CBD Brands is straightforward: We work to enable you to understand, discover and make an informed choice before making a purchase. We only feature the very best CBD along with vape goods that address your issues, wants/needs, plus budget. We’re continually testing, exploring and reviewing new products. So that we’re able to make highly educated recommendations. Our greatest priority is to be a dependable and independent source to help teach the world on the benefits of CBD and Hemp based products. 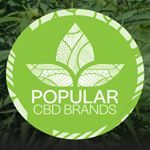 Demographic data for @popularcbdbrands' audience is available for free to influence.co users.